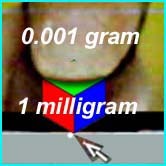 because there are exactly 1000 milligrams in 1 gram. that the kilogram be the Base Unit for MASS. meaning 1000 times as much.